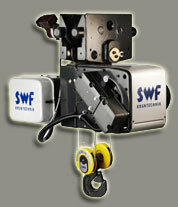 ROMACKcrane hoists, which are provided by SWF & Street Cranes, are specifically designed to meet the challenging requirements for precision lifting and moving beyond the millenium. High tech provides a new level of performance and productivity through applied value engineering. Inevitably, a hoist designed to meet the needs of industry beyond the current century must provide an excellent solution in terms of the price/performance ratio and our wire rope hoists certainly meets this demanding criteria.